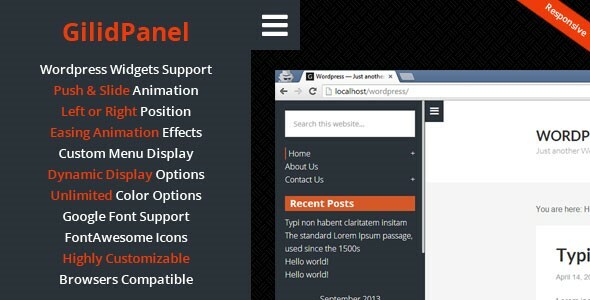 GilidPanel - WordPress Sliding Panel Sidebar - CODELISTPRO | Free Premium Scripts, Plugins, Apps Source Code. GilidPanel lets you easily build slide out panel for any kinds of content using wordpress sidebar widgets. This plugin comes with “slide” and “push” animation effect with jquery easing options and can be assigned either on left or right side. This also comes with responsive scrollable contents that will allow you the add as many contents as you want!